Today I heard that the new card set by Topps was out. Of course I don’t actually collect cards anymore. At least not real cards. I just make fake cards using my pictures. As a child the set that really has always stuck in my mind as one that was hard to get was the 1987 Donruss set. I had a factory set of Fleer early in the year, and you could by a pack of Topps anywhere it seems like. I bought a lot of them too. Donruss though seemed to be very hard to get. My father bought me many packs to try and complete the set. We had a lot of fun putting the set together which we eventually did. For that reason this set will always have a special place for me. I took this picture of John in 2009 on my birthday. What better present could I get than watching a great pitcher having a good game. This is the 4th time that I have posted an ’87 Donruss card. With this being the 25th anniversary of the set I am sure that a few more will pop up on here over the course of the summer. This is also the 45th time that I have posted a St. Louis Cardinals card. 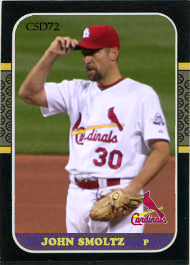 For some reason this is only the 2nd time that a John Smoltz card has made it onto the site. That may have to change. This entry was posted on February 8, 2012 by Pinola Photo. It was filed under 1987 Donruss, John Smoltz, P, St. Louis Cardinals and was tagged with Baseball, Collecting, Donruss, John Smoltz, Sports, St. Louis Cardinals, Trading card.